The seasoned actress brings only the bare essentials inside her designer bag. See what they are. Bing Loyzaga initially did not want to show Cosmo.ph what’s inside her Chanel bag when we spotted her at the press conference of the ABS-CBN soap Rubi, held last February at Eastwood City in Libis, Quezon City. The popular kontrabida actually plays a different role in this Pinoy adaptation of the Mexicanovela. “Mabait ako dito,” she proudly told Cosmo. After the event, we asked her again if we could take a photo of the things inside her bag. While checking her stuff, she was surprised and told us, “Ang konti lang pala ng laman nito!” Aside from the blazer she wore to the event, the bag also contained what Bing considers the most important thing for a celebrity: perfume. That night, she carried with her a Jo Malone scent. “Hindi dapat mawala ’to. Dapat laging nagpapabango para naamoy din nila ako kahit sa TV lang,” she told us with a wink. Bing also mentioned that she did not purchase this particular bag. 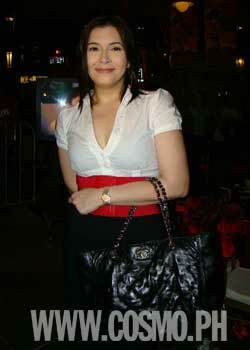 It was actually given to her by beauty surgeon Dr. Vicki Belo as a Christmas gift last year. “This is my first Chanel bag. I don’t buy expensive bags! I’d rather spend my money on more important things,” she explained. See the other contents of her bag by clicking on the “view gallery” button below.